1. You don't have to be married to be in a committed relationship. I completely understand people's arguments that marriage is just an institution that has nothing to do with their love for one another. This belief is deepened by the fact that some loving adult couples are not legally allowed to marry, and I believe that their love is just as important as anyone else's. Marriage doesn't change who people are. 2. Being married in no way guarantees two people are ready for parenthood, and two people who are not married (or a single parent) can easily be better-prepared, more committed parents than two married individuals. 3. Married people can have unplanned pregnancies, and non-married people can responsibly plan to have a baby. I really do believe these things, which is why I've been surprising myself lately. My husband and I are traveling for the first time since our daughter was born, which means we're out and about around strangers for the first time. People love babies, and they keep coming over to ask how old she is, gush over how cute she is, etc. It's nice, and I appreciate it. But I've noticed something strange. See, my wedding rings don't quite fit me yet. I had a lot of swelling during pregnancy, and even though I'm only five pounds above my pre-pregnancy weight, my fingers are still a little swollen. I've found myself conscious of the fact that I'm not wearing my wedding rings whenever a stranger gets close to look at the baby. It's not a huge deal, but it makes me wonder why I'm doing it. Somewhere inside me, I want these strangers to know that I am married to this man and maybe even that we planned this baby, that we're responsible adults who are in love. 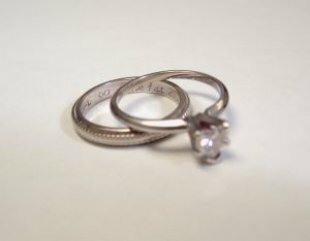 Of course, my wedding rings don't necessarily say any such thing. Any why do I care what these people think about my private life? I know what kind of life and marriage I have, what kind of parent I am. What difference does it make? Maybe it's because we're young. My husband and I are both 25. We both have advanced degrees, careers, and own a house, but some people (and not just strangers) have suggested we're too young for a baby. Maybe this has caused some insecurities that make me want strangers to know that we're married? Maybe it's because we're an interracial couple. I've read some studies that say while interracial dating rates have increased, interracial marriage rates have basically stayed the same. But again, why does it matter to me what these observers think? It's an interesting reaction that I'll have to keep pondering. In the meantime, I'll refrain from screaming "we're married" at innocent people congratulating us on our daughter.